Kurdish People’s Protection Units [YPG] reportedly razed the tomb of a prominent Arab sheikh in Al-Hasakah province, Al-Hasakah-based Arab media activists told Syria Direct on Thursday. “The area where the shrine is located used to be under [Islamic State]-control, and even though [IS] fighters destroyed a number of other shrines [in the area], they did not raze this one so as not to antagonize the Arab tribes,” said Ali al-Harith, an activist in the Al-Hasakah countryside. “There is no real strategic importance to the shrine, except that it’s symbolic for the Arab tribes,” Siraj al-Din al-Hasakawi, the pseudonym of another Arab activist in Al-Hasakah, told Syria Direct Thursday. The news of the razing comes in the wake of the YPG’s victory in the countryside near the town of Tel Brak from the IS earlier this week, reported the pro-opposition Step News Agency on Wednesday. Pro-Kurdish news agency ARA News reported on Thursday that “life was returning to as it was before” in Tel Brak and the surrounding areas. Fighting for control of Al-Hasakah province between the YPG and regime forces on one side and IS on the other has intensified in the past two weeks. Syrian warplanes destroyed a school in a pro-opposition northern Idlib town with a missile attack on Thursday, killing at least nine civilians, reported pro-opposition SAS News Agency. “There is no base for any opposition faction in the town,” Ammar Bakur, a media activist from the area, told the pro-opposition station Radio Al-Kul. Six of the victims were students, while the other three were teachers, Bakur said. Syrian state media and pro-regime news outlets did not report the incident. Most of Idlib province, with the exception of the eponymous capital, is controlled by rebel groups, the most prominent among them Jabhat a-Nusra. Jabhat a-Nusra blew up a building in the Air Force Intelligence compound in regime-controlled western Aleppo on Wednesday after detonating explosives in a tunnel under the main building, as seen in this video. The explosion may have provided a symbolic victory over a dreaded and notorious branch of Syrian state security, but regime warplanes then bombed the area via jet and surface-to-surface missiles to clear it out. They pushed the rebels out of the Zahra neighborhood and retain control of the compound, reported the Aleppo Media Center. The attack resulted in 20 regime casualties and 14 casualties from Jabhat a-Nusra and other allied factions opposition, reported the monitoring group Syrian Observatory for Human Rights. It was not immediately clear whether detainees were inside the building at the time of the explosion. In its account of the attack, the SOHR said that after intense shelling and scattered skirmishes in the surrounding a-Zahra neighborhood, regime forces regained control of the Branch and the area around it. Official state news agency SANA reported that regime forces had foiled a terrorist infiltration into the environs of the compound, which coincided with a minor earthquake in Aleppo. 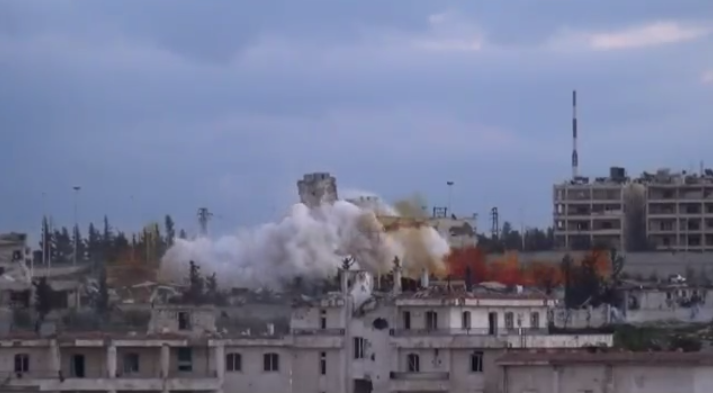 Nusra bombs the Air Force Intelligence building in Aleppo. Photo courtesy of ARNN.